With all the talk today about the school shootings, it would not be surprising to see previously "fearless" children thinking that there might be a monster – or a madman – around any corner. They may even fear going to school. absorb all that horrible news. And today, even some "children's shows" are filled with violence and fear-inducing images. You have to wonder what those producers are thinking – or if they are. It would also help to stop talking about fearful subjects when the kids are listening. They can pick up on your conversations and translate them into imaginary terrors even more horrifying than the events taking place in the world. If you yourself are fearful, they will of course pick that up. Kids are "tuned in" far more than the average adult. At the same time, if the kids have questions and want to talk about it, do talk with them. At Christmastime, Michelle Malkin wrote a good article on protecting kids. You might want to read it and implement some of its suggestions, so you yourself can feel safer and convey that feeling to your children. 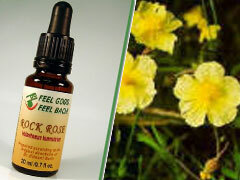 Meanwhile, a bottle of Rock Rose on the bedside table could let you all get some restful sleep. This is Dr. Bach's essence of courage - the one that helps banish terror. Sleeping pills are not a good idea for children - and along with other harmful side effects, could actually cause greater nightmares. So if you or your child is suffering from nightmares, get a bottle of Rock Rose. Fear, when not challenged, can rule your life. The more you give in to it, the stronger it grows. Eventually, you stop going places and doing things because you're afraid. Fear is usually not rational, but usually does have some basis in past experience. For instance, I knew a woman who was afraid to drive a car because she had once been in an accident when she was driving. Never mind that she was stopped at a light when someone crashed into her. Another woman is terrified of dogs because she was bitten as a child. Many are terrified of flying, even though statistics show it to be safer than driving a car. I personally have to battle a fear of dentists because of several bad experiences as a child, and driving (or riding) on icy roads used to put my stomach in a knot. Whatever the fear, when it limits your activities and keeps you from doing the things you should do or want to do, it's time to fight back. Feel Bach's Feel5ive can help you do just that. Feel5ive is Dr. Bach's original anti-stress, anti-fear blend, and it can get you through everything from being nervous before a job interview or your first meeting with your sweetheart's parents - to facing the fears that limit your life. Personally, I think no household should be without it, because it comes in handy so often. People in a negative Red Chestnut state suffer from an ailment called "What if." During normal times, this ailment prevents sufferers and their families from fully enjoying life. Even when things are good, they're thinking "what if" something goes wrong. And sadly, things often do go wrong for them, for the same reason that the ailment can keep you unemployed. So how can a negative Red Chestnut state keep you unemployed? Through the Law of Attraction. The Law of Attraction says that we get what we think about most. Worrying and thinking "What if I never find a job" can make that fear come true, because the more you think about being unemployed, the longer you'll stay unemployed. So right now, begin working on it. When you have those thoughts, turn them to something better. For instance: "What if I find a better job than I've ever had before." The Feel Bach! Flower essence RedChestnut will help you accomplish that goal. Dr. Bach's essences help to re-balance your energies, allow you to listen to your inner voice, and assist you in your efforts to turn your thoughts toward a positive outcome. So don't waste another day on negative, self-defeating, "What if" thoughts. Get Red Chestnut and start toward a better future. People make jokes about the "empty nest" but if you're the one missing your children, it doesn't feel very funny. If your kids are out on their own now, living in another city, you may be suffering from acute loneliness. And if they were home with you for the holidays and have now gone back to their "other life," it can be even harder to face their absence. If your "empty nest" blues are interfering with your enjoyment of life, it's time to banish those blues. The first step is to consider the cause of your unhappiness. Are you simply not happy about change of any kind? Perhaps you like the same predictable routine, and would keep everything the same indefinitely. Many do feel this way. Unfortunately, life is change. Walnut is the one of Dr. Bach's Remedies that will help you let go of this attachment to sameness and move into the future. Dr. Bach called The Walnut Flower Remedy the “breaker of spells” because of its ability to untie our bonds with the past. But change itself might not be what's bothering you. Perhaps it’s fear. Will your child be safe? Will he be happy? Will she be successful? When you can see your child every day you can offer your protection, but now… you're afraid for him or her because you're not there. 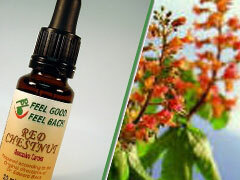 RedChestnut is the Feel Bach Flower Remedy that can free you from this anxious state. 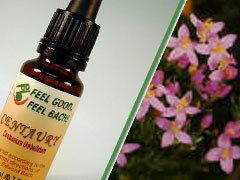 Follow the flower essence links above to read more about each, then visit Feel Bach! to order a blend made just for you.